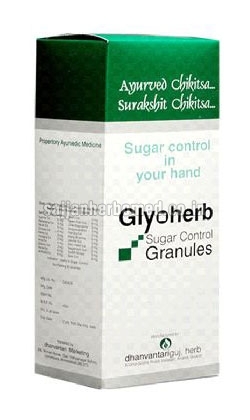 Glyoherb Sugar Control Granules are helpful for diabetic patients. We are an unsurpassed Supplier of Glyoherb Sugar Control Granules from Punjab, India. The Glyoherb Sugar Control Granules we make available are highly effective and do not result in any kinds of side effects. To retain the purity and therapeutic properties of the Granules, special care is taken about the packaging. Buyers can obtain the Granules in immaculate quality packaging and at reasonable rates. Amala Ext. : Contain a lot of vitamin C, Increases resistant power, improving the immunological barrier given along with Haldi in diabetes to lowering blood & urine sugar. Galo Ext. : It has avoidable effects on Glucose tolerance; Glucose up takes Detoxification and hepatic Stimulatio. Mahamejva Ext. : Bitter tonic reduces blood Sugar mildly. Methi Ext. : Has hypoglycemic effect and lipid lowering properties. It regulates glucose metabolism & stimulating liver activities. Neem Patti Ext. : Bitter tonic, has wound healing and Anti Inflammatory properties Helps to stimulate pancreas secretion. It is prophylactic in micro-anginapathy. Nagarmoth Ext. : Corrects metabolism overcame excessive thirst. Shuddha Shilajit : It helps in oedema. It has tonic effects. Its all time useful in DM and all time useful in Diabetes mellitus. Gokshur Ext. : These herbal medicine is diuretic as well as improves heart functioning. Devdar Ext. : This is herb play good role in simple as well as in infectious type of diarrhea. Katuki Ext. : This herbal medicine is appetizer, digestive and carminative too. 1 Pouch before / after breakfast.